On September 14, 2018, about 1020 eastern daylight time, an American Aviation AA-1A, N9218L, was substantially damaged after it impacted terrain during a forced landing in Warthen, Georgia. The commercial pilot and passenger sustained minor injuries. Visual meteorological conditions prevailed, and no flight plan was filed for the flight that originated from the Oconee County Regional Airport (CEU), Clemson, South Carolina, and was destined for Summerfield, Florida. The personal flight was conducted under the provisions of Title 14 Code of Federal Regulations Part 91. The pilot reported that earlier during the day of the accident, he purchased the airplane in Morristown, Tennessee. He filled up each of the two fuel tanks with 12.5 gallons of fuel and departed from Moore-Murrell Airport (MOR), Morristown, Tennessee around 0730 destined for Summerfield, Florida. While flying at a cruise altitude of 9,500 ft. mean sea level, about 20 minutes after takeoff, he noticed the fuel level was down to a one-fourth tank of fuel in each fuel tank. The pilot thought the fuel burn was very high and decided to land at the closest airport, which was CEU. He filled up again with 24 gallons of fuel and departed about 0950. About 30 minutes into the flight he noticed that the fuel level was at one-fourth tank in each wing fuel tank again. The pilot further stated that he decided to divert to the nearest airport, which was OKZ. About 15 miles away from the airport, the engine lost all power, he switched fuel tanks to the right fuel tank, activated the electric boost pump and the engine restarted. A few minutes later the engine again lost all power again and he noticed both fuel tanks were empty. The pilot located a field and configured the airplane for landing. During the rollout in the field, the nose landing gear contacted some soft dirt and collapsed. The airplane slid 90° to the left and came to rest upright. Both occupants egressed through the canopy. Examination of the wreckage revealed that the left-wing tip was crushed, and the main spar was damaged, and the nose landing gear had collapsed. There was no fuel in either the left or right fuel tank. Two gallons of fuel was poured into the right fuel tank, and the electric fuel pump was turned on. Fuel began draining from the carburetor float bowl, and examination of the bowl revealed that its threaded plug was missing. 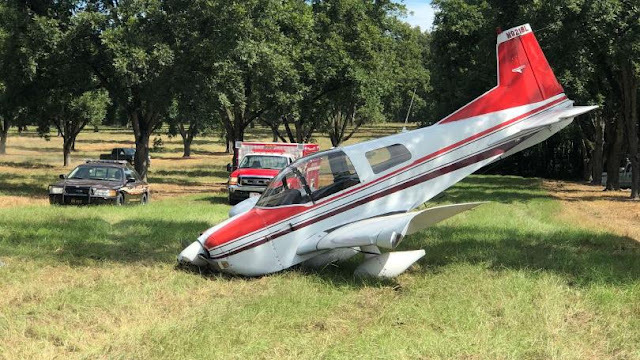 According to Federal Aviation Administration (FAA) records, the pilot held a commercial pilot certificate with ratings for airplane single-engine land, airplane multi-engine land, and instrument airplane. He held an FAA third-class medical certificate issued August 30, 2018. At the time of the medical examination, the pilot reported 700 total hours of flight experience. The airplane was issued an airworthiness certificate on June 9, 1971. According to the FAA type certificate data sheet for the American Aviation AA-1A, the airplane was originally equipped with a 108-horsepower Lycoming O-235-C2C engine, driving a two-bladed McCauley 1A105 SCM 7157 propeller. The engine had been replaced with a 150-horsepower Lycoming O-320-E2 engine, driving a two-bladed Sensenich propeller. The airplane was also equipped with two 12-gallon fuel tanks, for a total fuel capacity of 24 gallons, of which 2 gallons were unusable. The pilot reported that the airplane had recently undergone an annual inspection as well as a pre-purchase inspection; however, he was unable to locate the airplane's maintenance logbooks log books following the accident. The airplane's maintenance history, including any work done to, or inspections of the carburetor could not be determined. WASHINGTON COUNTY, Ga. (WRDW/WAGT)-- A small plane crashed into a pecan orchard after needing to make an emergency landing Friday afternoon. The Federal Aviation Administration is investigating the cause of the crash. The Washington County Sheriff's Office and first responders found the plane at the 13000 block of Sparta Davisboro Road around noon, that's just outside of the city of Warthen. Officials say there were mechanical issues so the small aircraft needing to land. It crashed into a pecan orchard. The two people on the plane suffered minor injuries. Emergency first responders treated the victims on scene and notified the Federal Aviation Administration. Federal Aviation Administration is investigating the cause of the crash.